The main event of the Aussie Millions was won by the homebred Manny Stavropoulos who is a regular visitor at the Crown in Melbourne. 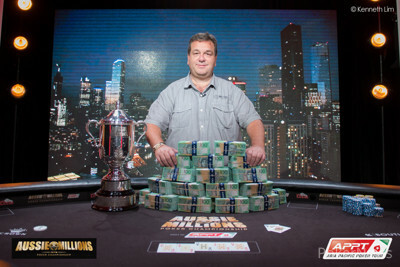 The weekend saw the crowning of the Aussie Millions Main Event’s 18th Champion as Manny overcame the last table consisting of tough opponents including Brian Rast, the two time WSOP bracelet winner. The regular at the Crown Casino defeated Lennart Uphoff of Germany heads-up to pocket the winner prize of US$1.08 million (AUS$1,385,500) while Andy Murray and Djokovic were battling right across the river for the Australian Open crown. The championship however will also be recalled for the third in four years Aussie Millions Super High Roller win by Phil Ivey and also $100,000 challenge first place finish of Richard Yong. The event saw Yong shrugging off the pressure engineered by his encounter with the American penal system and defeating his rival Ole Schemion in the AUS$100, 000 buy-in. The businessman and Poker player from Malaysia was among the nine arrested by FBI after the agency exposed a multi-million betting racket on World Cup, which was using luxury villas at Caesars Palace to carry out the operation. Yong as well could have been behind bars for five years but for his plea deal he stuck with the agency and in return received probation. Yong was also fined an amount of $100,000 and also had to forfeit cash and property worth $400K, but the AUS$1.8 million he earned from the AM will certainly reduce the impact by the judgment. His son Darren and compatriot Paul Phua have pleaded not guilty and are waiting to see the trial. In the meanwhile, Phil Ivey was in fine mettle as he busted and bested the last table which had formidable opponents like Eric Seidel, Doug Polk and Scott Seiver and finally won headsup after he defeated Mike Timex McDonald eventually. Ivey took AUS$2.2 Million for defending his title which would also help lessen the fact that he spent a lot of money to bail out his friend Richard Yong.